You will no longer annoying pop-up windows that open when you visit many sites. You can manually specify which sites allow pop-ups, but with what not. You are spared from the various spyware programs, as well as elements of ActiveX. You can independently control their privacy, flexibility to manage their personal data. The browser allows you to instantly remove the traces of their stay in the network. Search Bar, located next to the line input allows you to search any data in the global network. You can use multiple search engines. Support for RSS is built into the browser. Create live bookmarks and keep up with all the latest happenings in the world. Add site to bookmark, thanks to the yellow star in the address bar, it is now possible with one click. Manage Bookmarks, and standardized and implemented in a single dialog box. Select the required options become more convenient due to the presence of special groups recently added bookmarks, and most frequently visited websites. As soon as you start typing the address immediately a window appears with the tips, where the bold type shows all matches. The window contains a list of previously visited sites. String correctly responds not only to the addresses of sites, but also on their titles, which greatly simplifies and speeds up input. They are displayed in the window with a history of previously opened websites. Even if you do not remember the exact address and name of the resource will tell you the true path. Completely redesigned download manager allows pumps a file after a disconnection. The status bar always shows the number of received files and the approximate time until the download is complete. You no longer need to manually download new versions of the browser as they are released. The system updates automatically download a small patch the size of a few hundred kilobytes, saving you time. Simple, intuitive browser has everything that you may need in everyday life. Bookmarks magazine, full-screen mode, zoom text and much more - all this takes place in Mozilla Firefox. 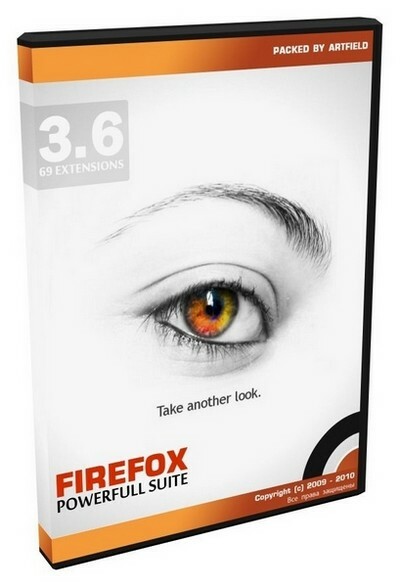 Mozilla Firefox - the most scalable and flexible customizable browser on the planet. You can customize the toolbar to put additional expansion modules and themes. Like the telescopic fishing-rod, Mozilla Firefox can be converted from a small compact browser amazingly multifunctional tool to explore the World Wide Web. Mozilla Firefox includes a built-in console error notifications on web pages. Additional extensions like Firebug, you can easily develop and debug web pages.